I have not been filled with gratitude the past week. In fact, despite the fact that it's the season for blessing counting (as I am reminded by the myriad of grateful people posting daily on Facebook) I have been feeling kind of frustrated. And maybe a little rageful. Don't worry though, it doesn't have really anything to do with the holidays. I'm a strong supporter of Thanksgiving, what with the veritable cornucopia of ways in which I can consume sugar and carbohydrates (IMHO you really can't argue with a meal in which it's acceptable to eat mashed potatoes and stuffing and sweet potatoes and pumpkin pie and, for good measure, a dinner roll). Oh yeah, and it's cool to see family and stuff. It's a week that's forced to come up with on-the-spot strategies for capturing a 3 year old who -- though she promised to hold on to the cart if I let her out of the cart to walk -- instead bolted toward the toy section in Target laughing in a manner eerily similar to The Joker and deaf to my pleas to come back to the cart. Come back to the cart! Lily! Come here now. GET BACK HERE NOW! Yelling is a failed strategy by the way. Also, sudden movement. If you're like me you end up taking the best of both worlds -- power walking with the cart toward the toy section. Leaving the cart within several yards of the escapee and taking the longest strides possible to reach out and nab your wayward child, much like you imagine a kidnapper might do. It's a week in which I found myself rooting through a gigantic pile of leaves in front of my neighbor's house in search of my 19 month old's lost shoe. Which is small. And brown. I waved to my neighbor as he looked out his giant bay window at me and tried to gauge whether that look on his face meant he was considering contacting the authorities because surely the person in his front yard digging through his dead leaves must be mentally unbalanced. It's not a week in which my kitchen floor got washed. Nor was the week before. Or the week before that. It needed to be scrubbed a month ago, in fact, yet there it lays -- accumulating dried, crunchy bits of Play-Doh, spilled milk and yogurt. I believe the small ecosystem developing in one especially hairy patch might have survived long enough to actually have evolved advanced life forms. I find myself wondering if I could meet them -- Avatar-style -- and let them convince me that their world is too precious for me to destroy with my scrub brush and trusty sponge. When I committed to participating in NaNoWriMo, I'd decided that the kitchen floor would be one area I'd allow myself to neglect. You know, in the name of art and stuff. Not that I have a huge list of options for things I can neglect. The children would not take well to my ignoring them in favor of writing a novel. Nor would the various clients I freelance for. While I have been considerably less consistent about personal hygiene and grooming, even I have my limits. That ragefulness I spoke of earlier has to do with this -- the lack of give in my schedule for this pursuit. And the fact that I'm my own worst enemy when it comes to creating this time. Case in point, I'd thought that this weekend would be a good time for novel writing, because I'd caught up with my freelancing work. Then one of my editors contacted me and asked me if I'd have time to pick up several blog posts for one of their high-profile clients (he thought I'd be a perfect fit for the job!). Most fibers of my being told me to say no. But there was, like, one fiber -- the loudest fiber as it turns out that -- that told me that I should never turn down work, especially with Christmas coming up. I hate that fiber. Really, I do. That fiber causes me a lot of anxiety. But yet I always give it the power. I think this fiber controls most moms I know. Maybe this fiber is guilt. Or, maybe it's fear. Maybe it's something else entirely. Whatever it is, it's always the thing that stops us from doing the thing that would be more satisfying and soul-nurturing to us than the thing it's telling us to do. My fiber is always telling me to take the extra assignments. If I take the extra assignments I will be contributing to the greater good of the family. If I don't take the extra assignments in favor of whatever else -- writing my novel or doing that painting project or scrubbing the GD kitchen floor (OK maybe that last one would be contributing to the greater good) -- than I'm being selfish. And mother's aren't supposed to be selfish, right? Mothers -- stay-at-home mothers in particular -- are supposed to relish every minute of their lives. Feel grateful for the opportunity to witness each and every moment of their children's childhood. Feel blessed that their partners are willing to sacrifice more income in favor of more quality time. Feel lucky for any opportunity contribute to the family budget in the hours between parenting. And truthfully, because it is Thanksgiving and all, I am grateful for these things. I am not being disingenuous when I say that. I was not happy working full time and putting Lily in day care -- it wasn't a good fit for our family. And the girls are so much a part of me -- they're like limbs -- autonomous, mercurial little limbs that scream for chocolate milk and plead with me to stop singing -- whenever I venture out without them I feel less than myself. But then there's that fiber again. Because these girls are not my limbs. Nor should they be the shields I sometimes use them as -- the one that blocks me from having to be a person separate from my motherhood. Motherhood, by nature, seems to be all consuming. It filters into every part of you person and influences decisions both big and small. This isn't a bad thing. But it's maybe not so great when you start forgetting that there are all of these other parts to your person that need to be tended to that have nothing to do with your children. 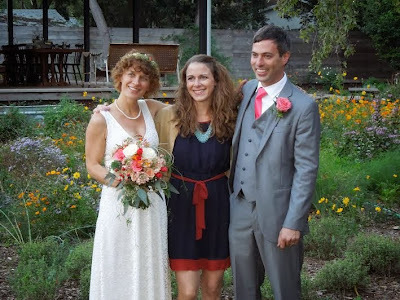 Me in Austin with the happy couple. Feeling happy! A couple of weeks ago I went to Austin by myself for my friend's wedding. I missed the girls. But not as much as I thought I would -- probably because I knew the three days away would fly by and I'd be back to the routine in a blink. Without the girls on my person I had to take my old self out of mothballs and trot her around -- the one who can carry on uninterrupted conversations about non-parenting related topics and who can sit down for extended periods of time without having to clean up spills. The one who can eat a meal without a kid on her lap and go to the bathroom without an audience. I really missed that girl. But here's the thing about that girl. That girl was never very confident, generally self-conscious and felt perpetually out of her league among most people. I'm not that girl anymore though. Motherhood (and perhaps hitting 30) transformed her into someone who is less judgmental and more empathetic and considerably more confident and carefree. The person I re-connected (or was introduced to) in Austin was this new-and-improved hybrid of past and present me who made me realize how much I've allowed myself to disappear into my role at home. Now I'm trying to figure out give that person some more attention. And it feels like an impossible task. Mostly because of that fiber. So my rage-fulness is the product of a mental war between my inner mother and my inner Susan -- that person that was a part of me long before Lily and Jovie. *Typing this made me smile and think of my grandfather … who always used to call me that.